Fallen Ninja finds the heroes of Ninjago at the bottom of a cursed tower. They'll need all their ninja skills to climb, leap and flip past deadly obstacles in an attempt to escape the tower. Unlock more ninja characters to play as Kai, Jay, Zane and Cole as you ascend, and see how high you can go! 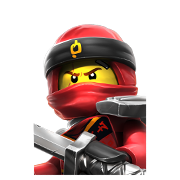 Play Fallen Ninja and other free Ninjago games on Cartoon Network.